Yoder Smokers Community Forum • View topic - Strange buzz coming from hopper/fan area. Strange buzz coming from hopper/fan area. I've had my Yoder since around May. It's worked flawlessly until today. I'm cooking some butts and it started making a strange noise. It occurs when the auger is activated. The best way to describe the noise is it's like the old "Operation" game. The one where if you touch the sides when removing the part it buzzed at you. The pit is keeping temp, so I know the auger is still turning. Any suggestions? Re: Strange buzz coming from hopper/fan area. 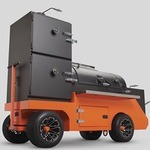 For factory support, please send an email to customerservice@yodersmokers.com so we may properly help. Buzzing was due to vibrating of the auger housing on a metal section of the hopper. Email tech support was great and when I had an additional question regarding the fix, phone support was great. A bit of velcro between the two parts took care of the noise. I've noticed mine does this when first started during colder weather. A few mins and a tap on the side usually stops it. Here's what ya need to do to fix it. This took care of my noise until the other day, but it was around 15º F and once it warmed up the noise went away.